Summer is here, temperatures are rising, and consumers are spending more and more time outside. Marketers are looking to reach these audiences with relevant messaging for the summer season. At GroundTruth (formally xAd), we know that location is the key to understanding consumers in these unique moments of intent. Where a consumer spends their free time can say as much, if not more, than which businesses they visit each day. While GroundTruth’s powerful and precise Blueprints™ location targeting is ideal for reaching consumers in and around business where the majority of commerce occurs, marketers are not limited to these locations. As consumers are spending more time outside, GroundTruth is thinking beyond businesses and tracking summer travel and events to see where the hottest spots are around the country. 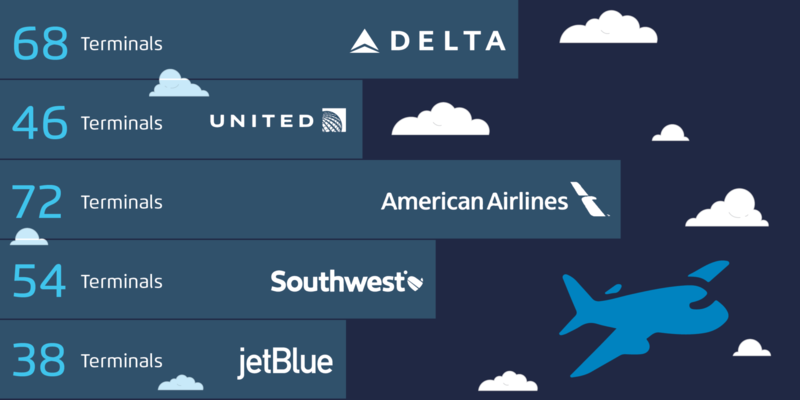 GroundTruth has Blueprinted over 500 commercial airports in the U.S., as well as individual terminals to track where and with which airlines people are flying this summer. Through observed airport visitation, marketers will be able to target audiences such as business or leisure travelers based on their frequency of visits, time of day, and day of the week. With our precise location targeting technology, GroundTruth can even provide insight into audience differences between major airlines, such as which carrier attracts the most families or is the most popular for business travel. Let the debates begin! A location may not always mean the same thing throughout the day. For example, an event space may host a county fair during the day and a concert at night. Through temporary Blueprints™ and foot traffic analysis, GroundTruth can investigate consumer behavior at different festivals or sporting events, identifying audience characteristics and even brand preferences. Targeting temporary locations is possible through dayparting GroundTruth Blueprints™, a technique that breaks down ad serving by a time of day. For example, a brand may want to target fans at a basketball game only while the event is actually taking place, or shoppers at a recurring Farmer’s Market outside of Whole Foods every Sunday afternoon. Finally, GroundTruth wanted to think BIG with its Blueprints™…as big as the Grand Canyon. With summer being the most popular time to take off work, pack up the RV, and head to check out a little piece of America, GroundTruth is looking at foot traffic to top national parks to be able to reach consumers in these moments. For brands trying to reach an outdoor adventurer or families on vacation, observing visitation to these landmarks can give powerful insights into their audience and an opportunity to reach them with a relevant message speaking directly to their needs. To capitalize on targeting consumers in these unique moments of intent, advertisers must get location targeting right. In a recent test, GroundTruth found that bad location targeting can waste up to 80% of your advertising impressions. To avoid this, marketers should consider leveraging GroundTruth’s Blueprints™. When compared to radial fencing, it proves to be more accurate for location targeting and increases ROI by allowing marketers to hit the right people, at the right time with their messages. Ultimately, the goal of targeting a consumer based on location is to be able to increase relevance and drive action. Where someone spends their time, near businesses and beyond, says a lot about what messages and products will resonate with them. Precise location targeting combined with foot traffic analysis can help your business reach the right consumers at the right moments of their lives that often define who they are. Stay tuned for plenty of summer foot traffic insights in the coming months!